Arinca is yellow in colour and is a light texture oil with a faint nutty scent and infused in organic Jojoba oil. Uses: Ideal for treatment of bruises and relieving sprains, massage directly onto the affected area. Arnica also has mild anti-inflammatory properties on the skin. Made from fresh certified organic Arnica flowers (Arnica montana), infused in certified organic Jojoba Oil. A specific external treatment for physical trauma, sprains, bruising, insect bites and other injuries. Use immediately after strenuous exertion or injury to prevent, relieve and reduce swelling, bruises and pain, absorbs well, and soothing to the skin. For tender feet a footbath of hot water containing 10-15 drops of tincture has bought good relief. Applied to the scalp it will encourage hair growth. Safety Data: Suits all skin types. The mild anti-inflammatory properties of Arnica (Arnica Montana) can help with knocks & bruises. We do not recommend internal use at all. Do not use during pregnancy or on broken skin. Note: Great care must be exercised though, as some people are particularly sensitive to the plant & many severe cases have resulted from misuse, over use may cause skin irritation. 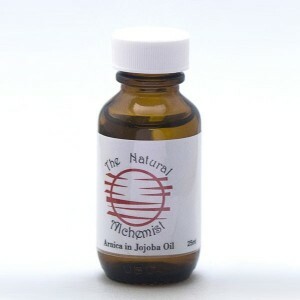 Other uses and recipes and tinctures can be found via Internet.